For my birthday in May, I spent the day at my nearest stately home and gardens – a small ‘stately home’ but one with an unspoilt feel, as it is not much altered since it was built in the 1550s. Canons Ashby used to be a twelfth century priory, and the medieval priory church still survives, with a little village around it. The site is in the rolling gentle hills and fields of South Northamptonshire; it is an open situation and the views are lovely. The house is an interesting place to visit in itself, however I’m concentrating on the garden here. It was laid out in formal style in the early 18th century by Erasmus and Edward Dryden, and the layout is the same today – unlike many gardens of the era, which were obliterated in favour of the Romantic, informal style of designers like ‘Capability Brown’. This is one of the few Baroque gardens to survive in the UK. Since 2008, the gardens have had a restoration programme, with planting schemes now based on the plans drawn by Sir Henry Dryden in the 1800s. The main garden is to the south, with a simple, formal layout of 4 levels connected by steps and slopes down a gentle hill. This leads down to gates opening out onto a wide view of the surrounding countryside. The top levels are full of bedding plants. This spring bedding is replaced in summer by other colourful plants such as dahlias and fuchsias. Here is the second terrace down. It’s reached by broad stone steps and steep grassy slopes, which are ideal for rolling on, as children quickly find out. The bottom two terraces were originally designed to be fruit gardens. Nowadays there are also vegetables. 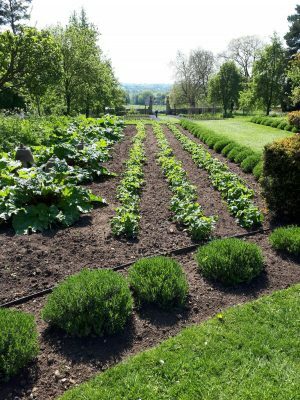 It’s a lovely place to wander, and one of the most beautiful settings for fruit and veg – much more open than the usual walled gardens in these kind of places. Not pictured are a big cedar tree under which there is a croquet lawn: people play there just as they did in previous centuries. Round the west side there is a topiary garden, containing a lovely statue of a shepherd boy and a collection of ferns. this used to be the main approach to the house, and there is a pair of gates with magnificent pointed finials on one side. Facilities include a tea room, a second-hand bookshop and a big picnic area. Across the road the old priory church is worth a visit. I recommend this for a relaxing day out.